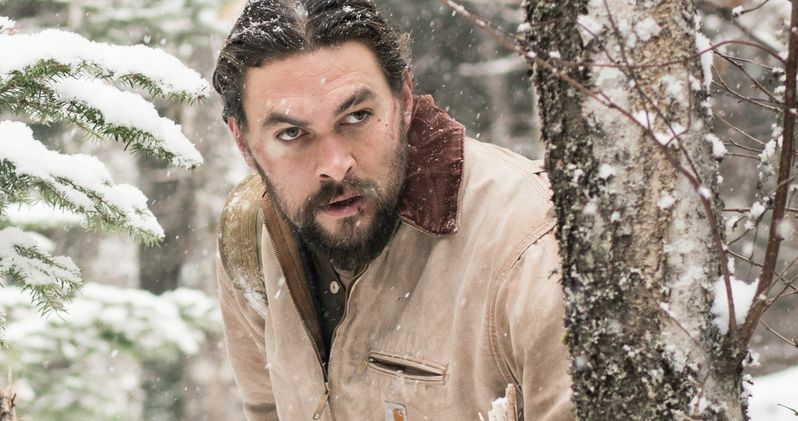 Highland Film Group has released the first look photo of Jason Momoa in the new survival thriller Braven, which recently wrapped principal photography. No release date has been set at this time, but Highland Film Group will be handling international sales at the Berlin International Film Festival. It isn't known when the first trailer may be released for Braven quite yet, so stay tuned. When Joe Braven (Jason Momoa), a humble logger residing along the U.S./Canada border, is confronted by a group of deadly drug runners in his secluded cabin in the mountains, he must do everything in his power to protect his family. Little do the elite drug runners know the unassuming man they've encountered has an impressive bite colliding two dynamic forces - one fighting for the lives of his family, the other for the love of the kill. The supporting cast includes Garret Dillahunt, Stephen Lang, Zahn McClarnon, Brendan Fletcher, Jill Wagner, Sala Baker, Teach Grant, Fraser Aitcheson and James Harvey Ward. Lin Oeding is directing from a script by Thomas Pa'a Sibbett and Michael Nilon (Pay the Ghost). Jason Momoa is also producing with Michael Nilon, Molly Hassell and Brian Andrew Mendoza. While Braven's release is currently uncertain, fans will get their first look at Jason Momoa as the iconic Aquaman in Batman v Superman: Dawn of Justice, which hits theaters March 25. The actor will also return as Aquaman in Justice League Part 1 (November 11, 2017), his stand alone Aquaman movie (July 27, 2018) and Justice League Part 2 (June 14, 2019). He also has two other movies in post-production, The Bad Batch and Going Under, neither of which have release dates set at this time. Lin Oeding makes his feature directorial debut with Braven, after directing a number of short films and a recent episode of Chicago P.D.. Before turning to the director's chair, he was an accomplished stuntman and stunt coordinator, recently working on hits like Straight Outta Compton, Ant-Man and The Equalizer. Take a look at the first photo from Braven below, and stay tuned for the first trailer.